After eight years of waiting for official approval, when Come and See was finally released in 1985 it caused a sensation throughout the Soviet Union. With almost 29 million tickets sold, the film entered the canon of Soviet war films not only for its exposure to a wide audience but for its unrelenting violence and emotion. Come and See is a brutal bildungsroman that belongs on the high shelf with Tarkovsky's Ivan’s Childhood, Eisenstein's Battleship Potemkin, Kalatozov's The Cranes are Flying and Chukhrai's Ballad of a Soldier. Released to mark the 40th anniversary of the Red Army's victory over Nazi Germany, the action takes place in the rural Byelorussian SSR where the protagonist Flyora (Aleksey Kravchenko) is conscripted by the partisans and flung head-long into Germany's blitzkrieg assault on local villages. Following the socialist realist tradition of depicting children at war, the viewer is subjected to the trauma experienced by Flyora as he is transformed from a cheeky adolescent into a ravaged young man. According to the director Elem Klimov, audiences became so disturbed by the film that ambulances were sometimes called to treat viewers who had fainted or were suffering from debilitating fits. Part of what makes for this kind of reaction is the film's emphasis on psychological torture, as opposed to simply portraying physical violence. Perhaps the most devastating scene is when Flyora finds a young girl crying in the forest. Glasha (Olga Mironova) has been cast aside by a group of admiring soldiers; it is implied they have taken her virginity before leaving for battle. In the girl's distraught state, Flyora initially perceives her to be a “holy fool” but the two quickly form a kinship, and the film teases that their joint strength may allow them to survive the war. But bombs obliterate the forest moments later and both descend into a kind of psychosis that oscillates between wild laughter and weeping. What sets Come and See apart from other war films is its portrayal of children succumbing to madness. After Flyora learns that his family has been slaughtered he is overcome by an interior rupture and tries to bury his head in a patch of muddy earth. But the hope of erasing his trauma is impossible, and Klimov underscores Flyora's psychological breakdown with the use of sound. Oleg Yanchenko's score is merciless, filled with the discordant hum of machines that build into a dystopian symphony of broken waltzes and primal screams. Along with the parading of cows and the crowing of unseen birds in the forest canopy, there is an unflagging accretion of noise. During the film's central scene a German battalion locks villagers into a barn and burns them alive. Before the fire is lit a plucky solider announces that those without children will be spared. However, mothers and their families must die. 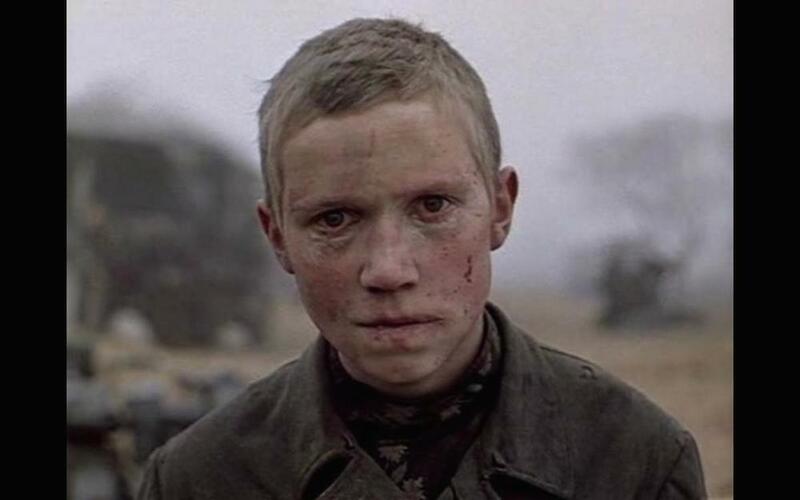 Klimov highlights the villagers' helplessness by portraying the Germans as dehumanised overlords intent on slaughtering children in pursuit of a blue-eyed utopia. The “inferior race” must be eradicated along with their ability to procreate. While the children burn, Flyora looks on in a blind daze as a group of soldiers gather around him and one presses a pistol to his skull. 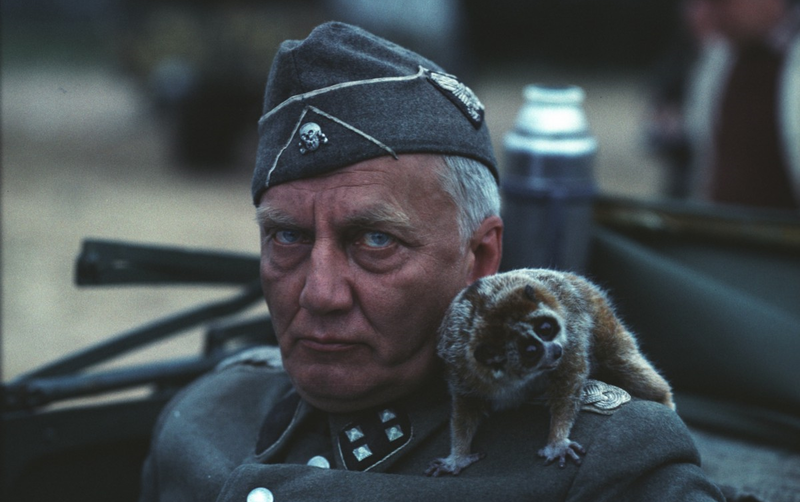 Somehow he is spared, and in the film's closing minutes he rises to fire repeated shots at a portrait of Hitler left behind by the advancing battalion. These shots throw the scene into a bizarre reversal of historical war footage where Hitler is shown to be growing increasingly younger, to the point where he is only a child in his mother's arms. Here the film seems to be asking a rhetorical question about the birth of evil. How, why, and where to now? Come and See's legacy of portraying the psychological damage of war on children has influenced numerous other films since the Soviet Union's demise. During the noughties particularly, directors and producers looked back to Klimov's film for how to reinvigorate portrayals of The Great Patriotic War. Aleksey Kravchenko, who played Flyora, was cast again in The Star (2002) as the determined Sergeant Anikanov. Now 17 years older, the actor's fresh-faced pallor in Come and See has hardened, as Germans advance along the Polish border in 1944. Rather than focus on a single protagonist, director Nikolai Lebedev follows a group of scouts — nicknamed “ghosts” — behind enemy lines. Although the group moves through a maze of marshes and thick foliage as Flyora did, the viewer is never allowed the intimacy of their individual experience. This dilutes the characters' trauma and elevates the Red Army's heroism as a whole. It makes for a peculiar experience to encounter a film produced in the post-Soviet era that offers little more than the generic tropes of old Soviet triumphalism. While The Star portrays the experience of children and young men on suicide missions, their psychological trauma is opaque, reduced to the kind of party-line martyrdom evident in Chapayev (1934) and Zoya (1944) – films that embraced the tidy storytelling of socialist realism. Bastards (2006) also draws on the experience of young soldiers, and like Come and See it caused controversy. Despite being awarded Best Film at the Russian MTV awards in 2007, the presenter Vladimir Menshov refused to hand over the envelope, objecting to the film's anti-Soviet propaganda. 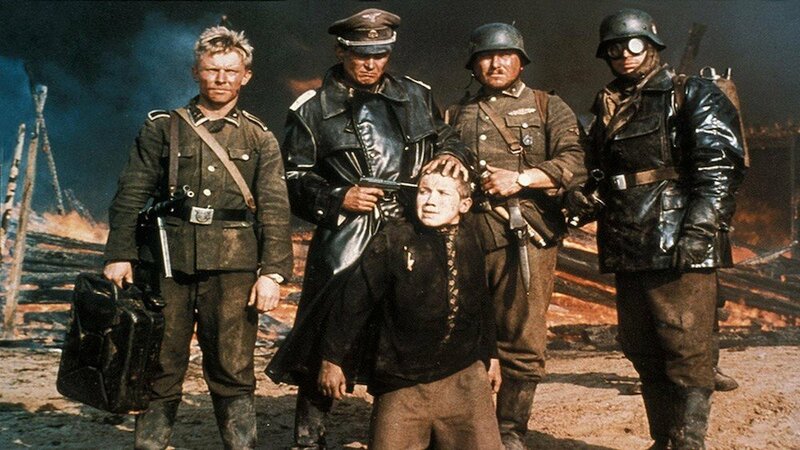 In a plot that mirrors Robert Aldrich's The Dirty Dozen (1967), boys aged 14 and 15 are released from prison and trained to destroy a German oil depot deep in the Carpathian mountains. The film was so widely criticised that the Russian Federal Security Service issued a press release saying their archives had no evidence of criminal teenagers being used in Second World War missions. While Flyora's trauma in Come and See was largely due to the experience of Nazi brutality, in Bastards the motley band of boys face a further trial: an assault on their identity. 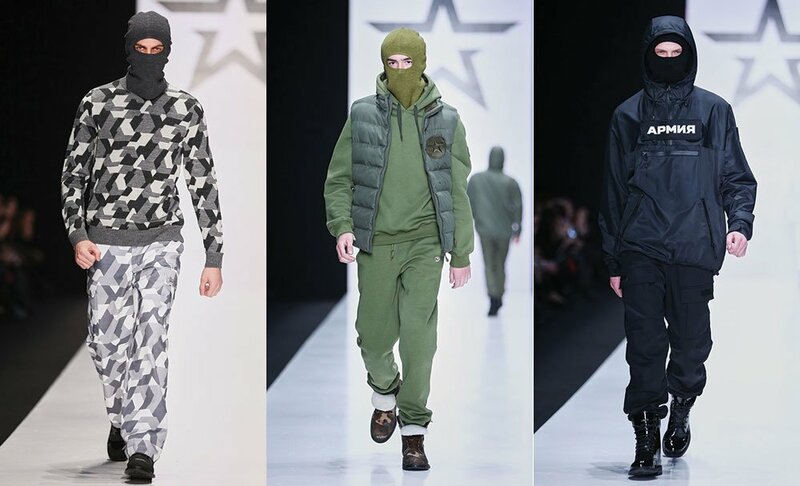 Subject to the same threat of mortality faced by regular soldiers, these criminals must fight to become a part of the Red Army's heroic collective while remaining as outsiders. Their charge is to fight for a country that has rejected them and undergo the existential threat of being comrades cast aside. The film's collective coming-of-age centres on Kot (Aleksandr Golovin) and Tyapa (Sergei Rychenkov) as they brave frontline action with fists and rudimentary weapons. Unlike in Come and See, where Flyora's composure becomes increasingly debilitated, the breakdpwn suffered by the “bastards” is offset by their evolving physical prowess. The most recent film to draw on Come and See is The Brest Fortress (2014), where director Alexander Kott focuses on a single protagonist. 15-year-old Sasha (Aleksey Kopashov) narrates the defence of a key fortress against the Wehrmacht during the opening stages of Operation Barbarossa in 1941. The film is a relentless portrayal of the German's blitzkrieg assault, and yet it fails to pause long enough to allow for an insight into Sasha's shifting mindset. As in Come and See there is a panorama of violence, where bombs reign, limbs are blown asunder and Germans machine-gun helpless civilians. But it's ironic that in never allowing this violence a reprieve, the damage done to Sasha's psyche is kept at a distance. Rather than achieving a balance between Sasha's interior life and the eruption of wild butchery, The Brest Fortress skews far too heavily towards battle scenes alone. At the close of the film Sasha is changed but not in the irreversible way experienced by Flyora in Klimov's depiction of the war. In the 30 years since Come and See's release, although its influence has been great, none of the more recent films have been able to realise the original's emotional acuity. Rather, it seems that despite the Soviet Union's collapse there is a tendency among recent directors for a more uniform and triumphal vision of the Second World War that is resonant of the Soviet era. There will no doubt be more films influenced by Come and See in the future, but if there is little embrace of its nuanced psychology they will never capture war's true devastation on an individual's mind and body.